With the recent strengthening economy, the overall cost of construction has continued to steadily creep up. For this reason, it is important to understand how your choices will affect and control the cost of building a new home or other major construction project. 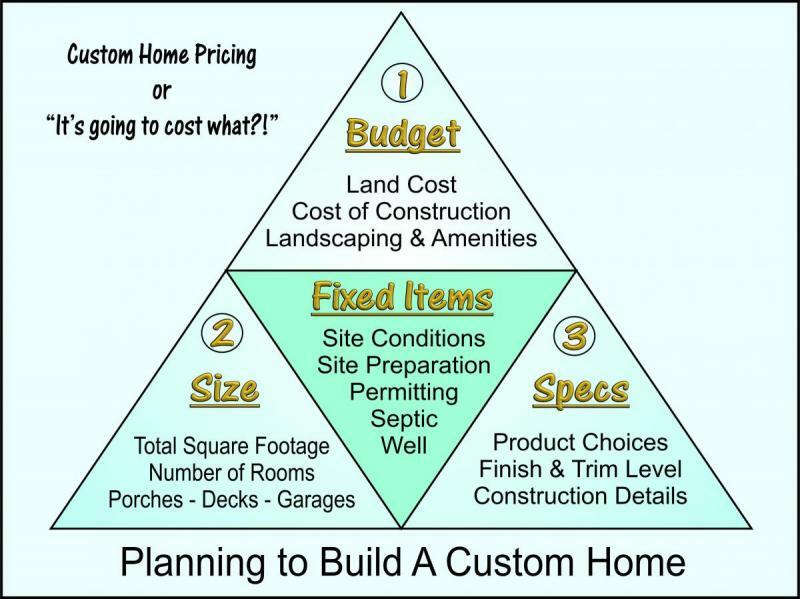 This chart illustrates how the planning process for a Custom Built Home involves the balancing of 3 variable conditions: 1. Budget, 2. Size, and 3. Specifications, in addition to the Fixed Cost Items. Only 2 of the 3 numbered items shown in the chart may remain fixed, at least one must remain a variable and will be determined by the limits of the other two. If you want to determine the 1. Budget and the 2. Size of a new home, then the 3. Specifications and style of the home will need to be variable to meet your size and budget requirements; it is not possible to specify all three conditions without limits. Determining the two variable conditions that are most important to you is the focus of our Lifestyle Design process. Flexibility with the third variable condition during design, planning, and construction will be necessary to meet your goals. If you want to determine the 2. Size and exact 3. Specifications of your project, you will need to be flexible with overall 1. Budget for your project. If you want to determine the 1. Budget and exact 3. Specifications of your project you will need to be flexible with overall 2. Size of the project. Using our Lifestyle Design Process, we work to identify your lifestyle priorities, and plan space needs for your new home. While designing your new home, we strive to incorporate as many of your lifestyle priorities as the construction budget will allow.